All Things Pumpkin…that’s what this weekend became, as I prepared recipes for Good Morning Texas (GMT) to remind you how wonderful this Fall season can be. Pumpkin sustained our American colonists. As one colonist said in 1683: “We had pumpkin in the morning and pumpkin at noon. If it were not for pumpkins we’d be undone soon.” So for the colonist it really was All Things Pumpkin! This segment will work with Sugar Pie Pumpkins. They are the nicest in texture and the sweetest in flavor. Pumpkins began spreading through our land in the 1800’s. The Sugar Pie Pumpkin was introduced just before the Civil War. Pumpkins and other winter squash can be used interchangeably in almost all recipes. There may be slight taste or texture change. All pumpkins, with exception to the tiny decorative ones may be cooked with. The larger ones tend to be tough and woody. I prefer Sugar Pie Pumpkins or Butternut squash in my recipes, but I do harvest all winter squash and pumpkin seeds for roasting…an extra Fall treat! Boiled Pumpkin has about 90 calories per cup. Baked Pumpkin has about 130 calories per cup…it’s the caramelizing of the natural sugars that drives the calorie difference, or addition of oil. If making your own Pumpkin puree (which I strongly recommend) DO NOT USE OIL to coat the pumpkin pieces before baking. You want your puree to be in its purist form. You will use oil when roasting or baking root vegetables, and pumpkin pieces for a roasted vegetable dish. At that time, you need the oil to keep the moisture in the pumpkin. Pumpkin puree stores well in the freezer for up to six months. Longer if kept in the back of the freezer. Freeze puree in one cup measures, so you know exactly what you have for your recipes. I try to freeze food in glass Ball brand jars when possible, but puree lends itself to plastic freezer bags because they can be flattened. You know when it was made and what’s in it. As the pumpkin bakes, your house smells fabulous! It’s how things used to be. 2 Sugar Pie Pumpkins yielded about 4 1/2 cups of puree depending on the size of the pumpkins. Wash & dry the pumpkin. Cut in half. Leave the skin on. Scrape out seeds and fibers…save those seeds for toasting & roasting. Cut the half into half or quarters. Make them the size of thin cantaloupe slices…they will be easier to peel. Place on baking sheet. I line mine with parchment paper (NOT waxed paper) for quick clean up. Use NO OIL, you want puree in its purest form. Place pieces on baking sheet, up, down, sideways…any way will work. The photo above is 2 Sugar Pie Pumpkins. Move oven rack to the center. Bake at 350º for 45 minutes to one hour, or until golden and fork tender. One hour works in my oven. When cool enough to touch, begin to remove skin with a knife. It should peel right off. Put baked pumpkin meat into a food processor or blender. Blend till you have the smooth consistency of canned puree or mashed potatoes. If it needs water, add in tablespoon increments. If it looks too watery, remove from processor and strain in cheesecloth or fine mesh strainer. I always strain mine. See photo above in collage. Use for any recipe that calls for Pumpkin puree. Season with spice recipe below or use individual spices as the recipe calls for. Freeze in one-cup measures for later use. Use plastic freezer bags, and flatten for more storage space. Label with both, day & date made. When ready to use, thaw in refrigerator. Cut the tip off the bottom corner of the bag. Squeeze puree into measuring cups or spoons. Now, doesn’t your house smell great. You should be in a Fall mood, and looking in your closet for that favorite turtleneck or sweater! I was listening to Bill Evans Jazz as I baked my pumpkins! 1. Roll the bag down, almost to half. As you fill with the one cup of puree, it is not such a mess. 2. Press all air out as you flatten. This flattening is why freezer bags work best. 3. A one cup measure Ball Jar is for use in the refrigerator for quick use…up to one week of being originally made. 4. Label with both, day and date and contents. 5. To use from the bag, thaw in refrigerator. Cut the tip off bag and squeeze the measurement needed. There would have been more seeds for this photo, but Mac and I ate them! I think I have tried every cooking suggestion and variation for roasting seeds. I have boiled them before roasting, and roasted with low heat and high heat. I searched the internet and found this fabulous, funny and detailed website. This man has tried it all, and charted it for the best results. It was the most useful information I have seen, so without re-writing the recipe for seed roasting, I would like to direct you to his link: The Manly Housekeeper-Man-Evolved; Tested: The Best Way to Roast Pumpkin Seeds [HERE]. The chart and final thought for what works is at the bottom of his post. In a jar, mix all four spices. Adjust to your taste, if you prefer less ginger, or more cinnamon, clove or nutmeg. When making a Pumpkin Pie, use 2 teaspoons of this for spices. A lovely way to have pumpkin pie without making the pie. This pudding may be used as a main entree side dish, or dessert. I serve mine warm. This is also a nice filling for pumpkin ravioli. 2. Place all ingredients in food processor or blender and process till smooth. 3. Adjust seasoning and serve warm. If you like, top with pecans or walnuts, and a shaving of nutmeg from a whole nutmeg. Pie crust dough is great to have on hand. It is a good way to get the feel of a cookie without the sugar in most cookie recipes. Makes two nine inch pie crusts, or about 22 maple leaf cookies, using a 2 inch cutter. This is also the crust I use for apple, pumpkin and sweet potato pies. You may omit the brown sugar and cinnamon for a plain basic crust. 1. In a large bowl combine flour, salt, sugar and cinnamon. Mix well. 2. Cut in the shortening. Work it with a dough cutter or two dinner knives (not sharp knives) till dough resemble course crumbs. 3. Add water in increments of 1 tablespoon at a time. I find I use about 1 tablespoon less than this recipe calls for. 4. Stir or work with hands (use gloves) until it forms a ball. 5. Divide dough into two balls. I shape into flat rounds. 6. Wrap in plastic or parchment paper and refrigerate 4 hours or overnight. 7. Lightly four a work surface, roll out dough to about 1/8 inch thickness. 8. Choose your cookie cutter. If using a two inch maple leaf, after cutting, use a knife point to press in leaf veins on both sides. 9. Mix the sugar, cinnamon and dash of salt together. 9. Sprinkle cookies with mix, and press mixture in…do both sides. 10. Bake at 350º for 20 – 30 minutes. Rotate baking sheet at half point of time. Watch for the desired golden brown color. Think peanut butter, not dairy butter. This is one of the yummiest ways to enjoy the season. Spread on apples, toast or crackers. Warm it and add a dollop to top pancakes. It can act as a frosting for muffins. It does not hold up like a frosting, but at the time of serving, add to the top of the muffin. 2 tablespoons ground flax (See the benefit of flax for women [HERE]. 1 TBSP whole flax seed becomes 2 TBSPs when ground. 1. Line a baking sheet with parchment paper, and toast the nuts of your choice on 350º for about 5 minutes. Watch them closely, they burn fast! 2. Place all ingredients in a food processor or blender. Blend till the consistency of peanut butter. 3. Place in a jar and refrigerate. Will keep for about 1 week. Muffins! I prefer muffins over loaf bread. They are so versatile and portable. I consider them a nutritious cupcake. For the FLAX EGG (which is not an actual egg). I buy whole seeds and grind them in my spice grinder. Whole seeds = Double ground: 1 tsp whole = 2 tsp ground. For this recipe, I grind 2 teaspoons heaped whole flax resulting in about 4 teaspoons ground flax. Place in small bowl, and add 5 tablespoons room temperature water. Allow to congeal for about ten minutes. Stir into recipe. The amount mentioned above works well, for me, in this recipe. The traditional flax egg equal to one chicken egg is a ratio of 1 tablespoon ground flax to 3 tablespoons water…just so you know! You may omit the nuts and dried fruit from baking inside the recipe, and place a few on top. If someone has a nut allergy, they can cut that portion off. 1. In a large bowl, mix together the sugar, oil, pumpkin, vanilla extract and egg. 2. In a separate bowl, mix in the flour, baking soda, baking powder, pie spice, and salt. 3. Slowly fold the dry ingredients into the wet ingredients. Stir the two mixtures to combine. Do not over work. 4. Add in the nuts and dried fruit if you are using that. 5. Spoon batter into a greased muffin tin. NOTE: If using the Flax Egg and Coconut Oil bake for approximately 50 – 60 minutes. If using a Regular Egg and Vegetable Oil, bake for approximately 25-30 minutes. If using coconut oil, and if you cut a muffin in half while it is still warm, it can appear un-done. This is because the coconut oil has not solidified back to room temperature. Once the muffins have completely cooled, they should have a dense, normal texture. I have also found that when baking with coconut oil and flax, the muffins stay fresh…they do not become stale the next day. To take the muffin up a notch, slather on the Pumpkin Butter. Phebe Phillips lives in Dallas, Texas with her husband, Mac, and their standard poodle boy, Henry Franklin Hargrove. 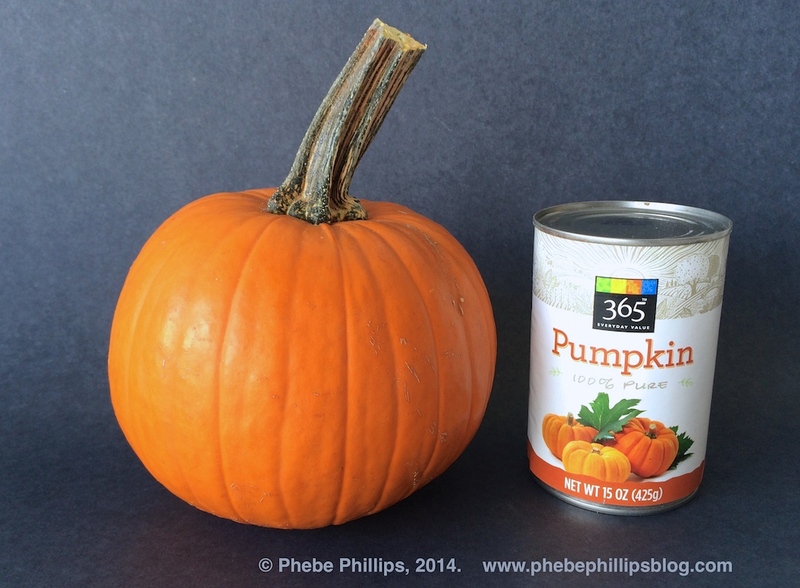 Great post Phebe – I am a true pumpkin lover and will give some of these a try! Best to you with your show!!! Hugs to all! This was a fun segment to work on. I think everyone should make their own pumpkin puree…it’s so easy.